The year has come and gone. It's been a very busy year, all good, but I just didn't have the time to get in one 100 miler this year so with a few days left in the year and the only opportunity available I took advantage of the situation. Our holiday guests left at around 9 or 10 am so I figured I could get my act together and be out the door by noon for a 100 mile run about. 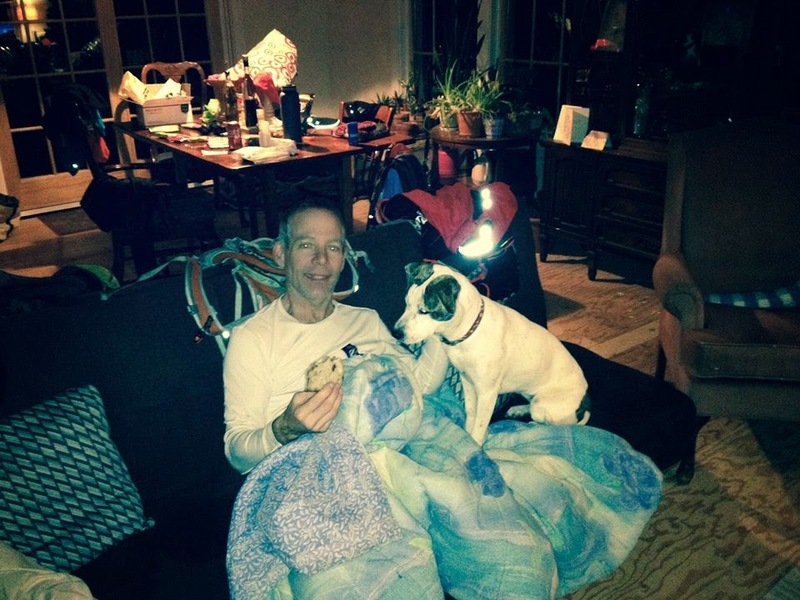 It was Saturday December 28th and with Kristin home, I didn't have to worry about entertaining the dogs either. Quickly I came up with 4 different loops originating from home which would be my main aid station. Other than that, I would carry the credit card with me for emergencies for the one loop into town (Burlington). The rest of the route would be on the back rolling hills of Charlotte, Hinesburg, Monkton and Ferrisburg. I laid out clothing for changing between loops and a variety of packs to use. Temps were unseasonably warm, high 30's and low 40's but with a steady wind out of the south. A change of clothes would be nice to prevent any hypothermia after sweating. And I chose to wear shorts as it would certainly be too warm for tights. Over heating for me is like blowing a thermostat so I wanted to avoid that. 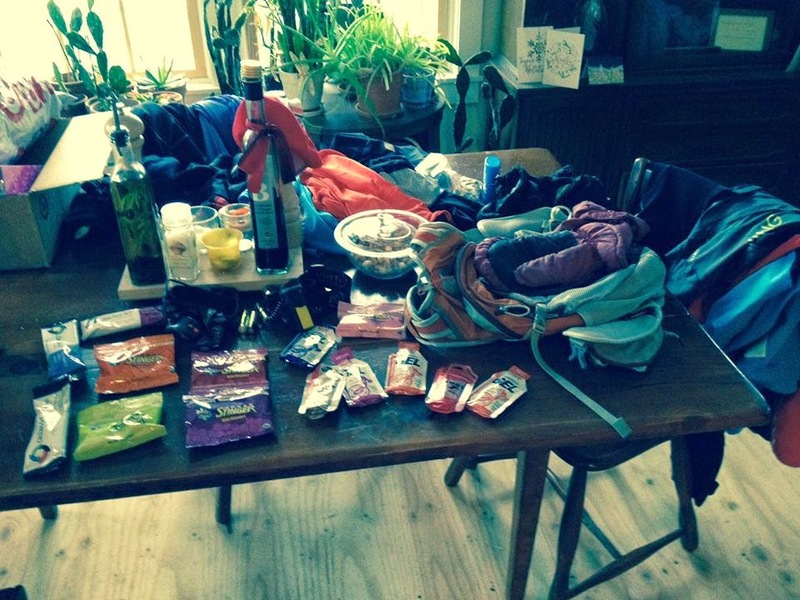 I set up some snacks at the aid station (dining room table) and Kristin added some awesome goodies to the mix. I gave Kristin a quick look at my proposed plan and opted to not even carry a phone as I would never be more than 15 miles from home and just didn't want to bother with it either. Kristin planned on running part of the first loop with me to see me off and then the final loop with me Sunday morning if all went well. Ready to head out, just need the Pearls on my feet. So noon came and for once I was ready and almost on time as we headed out the door. We both struggled a bit as the first 2 1/2 miles is pretty much all uphill and we were sweating out and peeing out all the alcohol and food we consumed over the holidays. At mile 5 Kristin turned around and headed home saying her goodbyes sending me off on my Holiday Adventure. So on I went into the head wind into Monkton and Ferrisburg. The roads were so soft that it felt like you were running on squishy marshmallows and it was difficult at times to maintain a good stride. And it was tiring. What I discovered at about mile 20 was that I was tired from not sleeping much for 3 nights and was hungry and didn't have enough food with me. But only 6 more miles and I could refuel. Not a big deal. I finally made it home at mile 26 and 4 hours into it and the aid station looked wonderful thanks to my lovely wife Kristin. 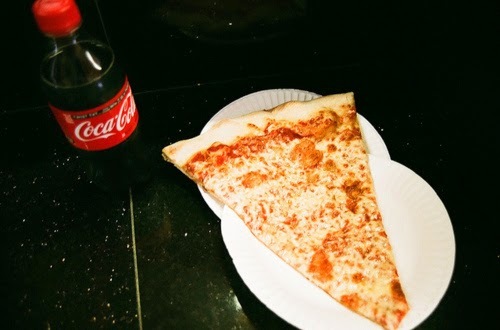 I had a peanut butter and jelly sandwich with some coke and a pickle which was awesome. I picked at a few more things and changed out of some sweaty clothes. I took my time as there was no one else running so there was no need to hurry. 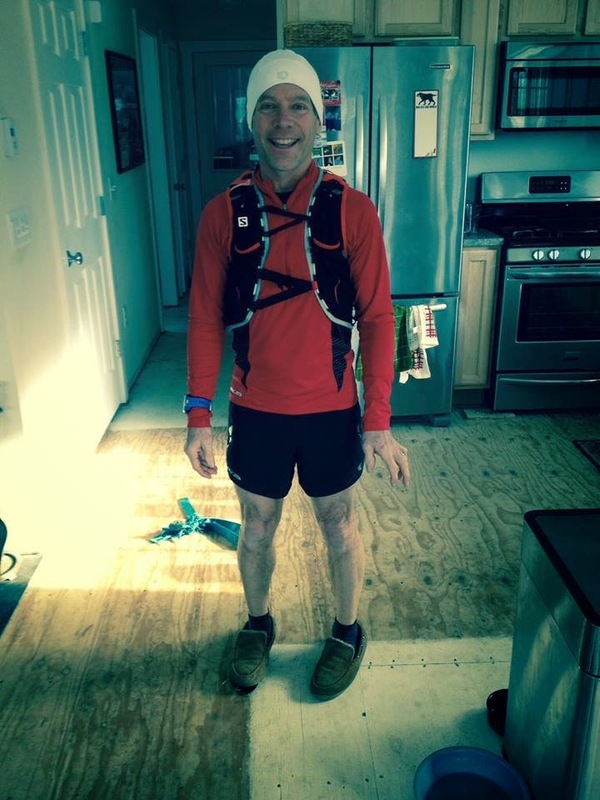 I decided to change my shoes too into the Pearl Izumi H3 road shoes as the next loop for 30+ miles I would be heading into Burlington to see the Xmas lights and running mostly on asphalt and concrete. The H3 has the most cushion and support which was definitely the right choice :) So after about a 30 minute break I was out the door again into the darkness with headlamp on. Thr run into town was somewhat effortless, nice and easy and with the wind at my back. I was also all fueled up so was feeling good again. That first loop really toasted me and I was ready to quit and wasn't feeling motivated but Kristin would have no part of that. For this Burlington loop I had grabbed a sport drink which I will not name. I had tried it in the past and it made me nauseous then but with many other runners having good success I thought I might try it again. Well, every sip was a struggle but I knew I needed to drink and so I did. I ran the back roads into Shelburne then RT 7 north since it had a sidewalk and I really didn't feel safe running at night on Spear or Dorset St. But I did venture off and run on the SB rec path up and around UVM to get off the beaten path. 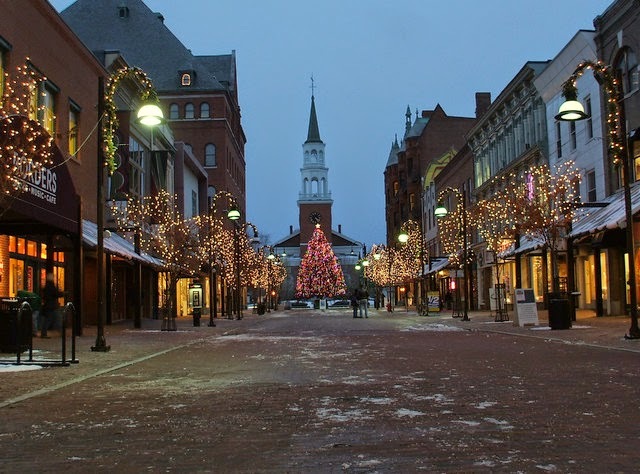 From there I headed into the old North End and all around seeing the festive holiday lights making my way to Church St.
Church St. was buzzing with holiday folks and all the stores and restaurants lit up. For me it was mile 44 and I was getting hungry again. I had a peanut butter and jelly sandwich in the pack but I wanted something different. 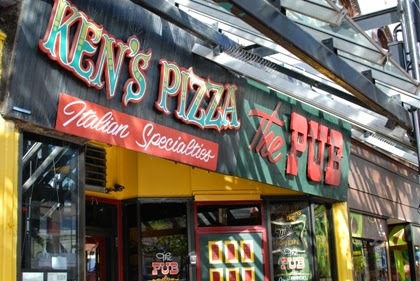 So I stopped at Ken's Pizza for a slice and a coke. It was the BEST! And it probably fueled me for a good 10 miles before I was even hungry again. I also picked up some Gatorade at Ken's. It seemed better at the time than that other drink and I could at least get it down. Heading from Burlington towards Charlotte the wind was starting to crank out of the south and right in my face and it seemed to be getting stronger each mile. Trying to avoid the direct in your face wind I took some alternative side routes going more east and west to break it up. It would add miles but that was ok as it would be less miles needed on one of the other loops. These alternative routes were good for a while but soon enough I was running into a dead on wind again. By the time I reached Shelburne Village the wind was really gusting. There was no way to avoid it either. I decided to run on Mt. Philo Road which became a wind tunnel at times. Luckily it wasn't frigid out and was bearable even though it would knock me sideways at times with the gusts. Finally I was home and squeaked out 34 miles on this loop so was now at 60 miles, only 40 to go! Another relaxing break at the home base aid station. Shoes off, change of clothes, eat and chill out for a bit, more like 30 minutes. 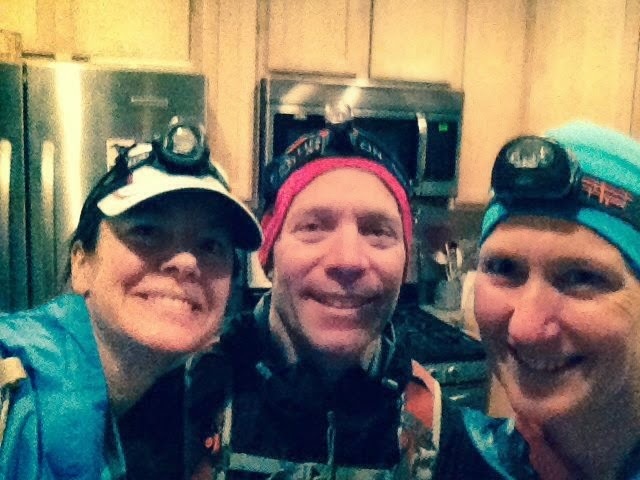 Nice thing about using the home for aid stations, heat, bathrooms, a refrigerator and slippers! For the next loop I decided to change it up. I had built up some extra mileage and wanted to avoid some of that screaming wind so I decided to stay lower and run the west side of Charlotte. I had originally mapped out a loop to Hinesburg with a lot of north to south running but this would be better. So off I went. I grabbed another bottle of that awful drink figuring it had electrolytes and calories which would be good. Off I went....about a quarter mile down the road I realized I forgot the hand held water bottle. Not good so back home and out the door again, this time with the hand held. Originally I was using a pack and had the water bottles in it but wasn't using a bladder and had a difficult time grabbing the water bottle out so decided a hand held would be more efficient. I ran all the usual east Charlotte Roads and did an out and back with some variations thrown in and some hills to change it up as the east side is relatively flat. Not a very exciting loop although I had to go by the "mountain lion" section twice but didn't see any eyes following me which was good. There have been numerous sightings of a large 90-110 lb cat in this area. How would one fight off such a large critter especially if it came up from behind? Luckily it was a quiet night with a few sprinkles of rain here and there. Hopefully the rain would hold off too. 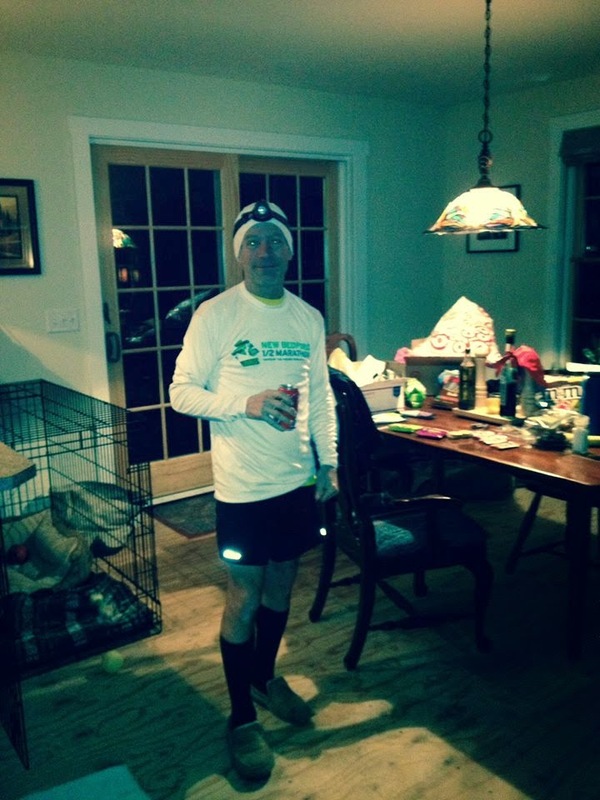 By 4:01 am I was back at home, now at mile 82. When I started on Saturday I had predicted arrival times at the house and figured I would be home at this point at 4:00 am, only off by 1 minute. I had a quick look at the weather and we were in big hole surrounded by rain which was coming quickly. I decided to put on the light tights as we would be heading back to East Charlotte and have a 3 mile section head on into the wind. Running in shorts in that would not be fun, especially if it was raining. Waiting for the girls I was eating another peanut butter and jelly sandwich and coke when all of a sudden I was not feeling so good. All of that "special drink" mixed together with Gatorade was coming to a head and I went running outside as Jen was arriving. Yes, purged big and got rid of all of that belly sitting fluid. Kristin came out with the camera to get pics as she thought it would be nice to document the run, what a nice wife. Luckily I was done by then and was feeling much better. I was able to nibble on some food after all that wrenching which was a good thing. After almost an hour break I was out the door with Kristin and Jen for the final loop. Heading out it was starting to rain a bit so I had put on the raincoat too. The first 2 1/2 miles is all uphill so of course I was overheating in the rain coat and tights so I took off the coat as the rain let up. And I was tired. I was doing a fair amount of walk/run, walk/run. As soon as we hit Guinea Road the wind was right in our face again so back on with the raincoat to prevent any hypothermia and kept it on for the next 3 miles. After that it was off again as we were no longer battling the wind. I wasn't feeling the best, the legs felt fine but the belly ached a little. It would come and go and I was able to nibble on some food. My running was good in spurts then I would just slow down and walk for a while. This loop had us in part of Ferrisburgh and Monkton before returning to Charlotte. More squishy dirt roads and luckily the rain was holding off. Finally back onto Guinea Road for the last leg with the wind at our backs and only 5 1/2 miles to go! I was starting to feel energized and wanted to be done so I starting to pick up the pace a bit making the girls work. Nothing like some speed work at mile 95 :) The final 2 miles are all downhill, add in a quick loop around the train station as we were .30 miles short and I was done. 20 hours and 47 minutes from when I started. And so it goes, finally a 100 miler to end the year. Thanks Kristin and Jen for that final loop!! Running for me was not top priority this year as I was just too busy with the house, wedding, new puppy, etc but it was all good. I still ran every day but ran the fewest miles since 2005. Only about 3,700 miles for the year. But my 8 1/2 year streak continues. I'm just over 35,000 miles for that streak. The second half of the year was as busy as the first but I ran all the trail races at Catamount and mountain bike raced most of the races too. And I ran with dogs which was all new for me. 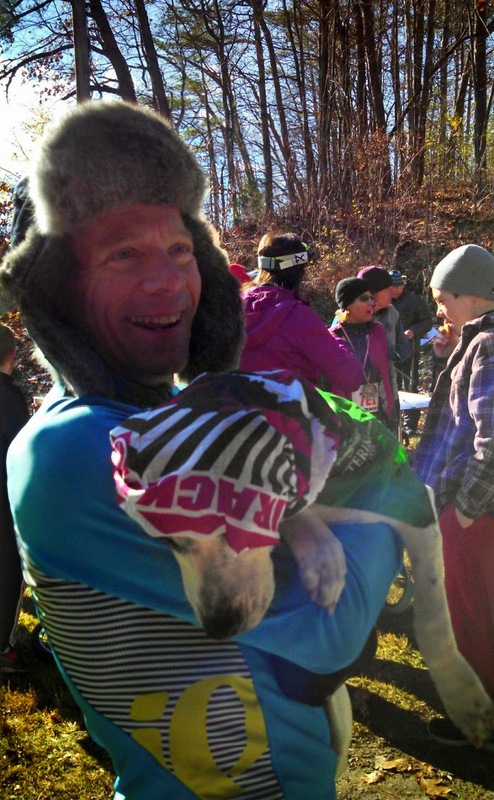 Pippa and I took top honors for the men at the Catamount Canine Crossing 5K. 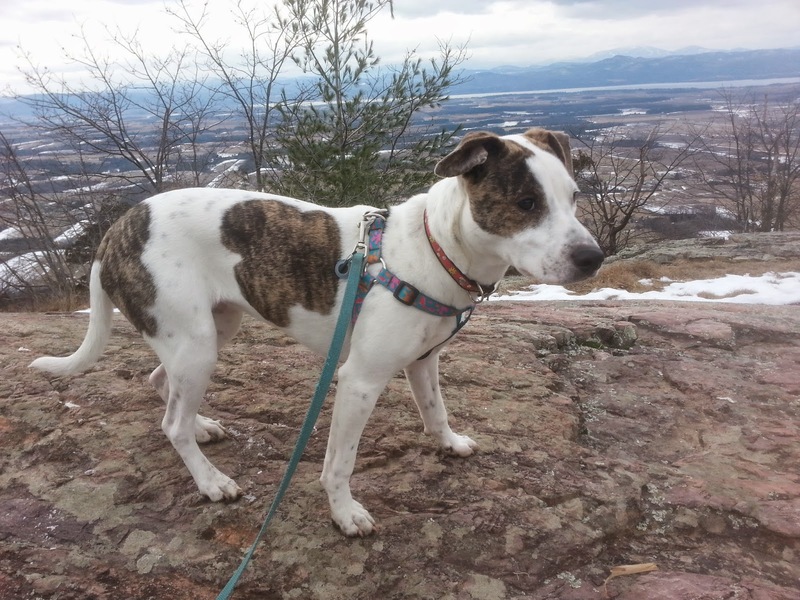 And little puppy Charlotte is becoming an awesome running dog. 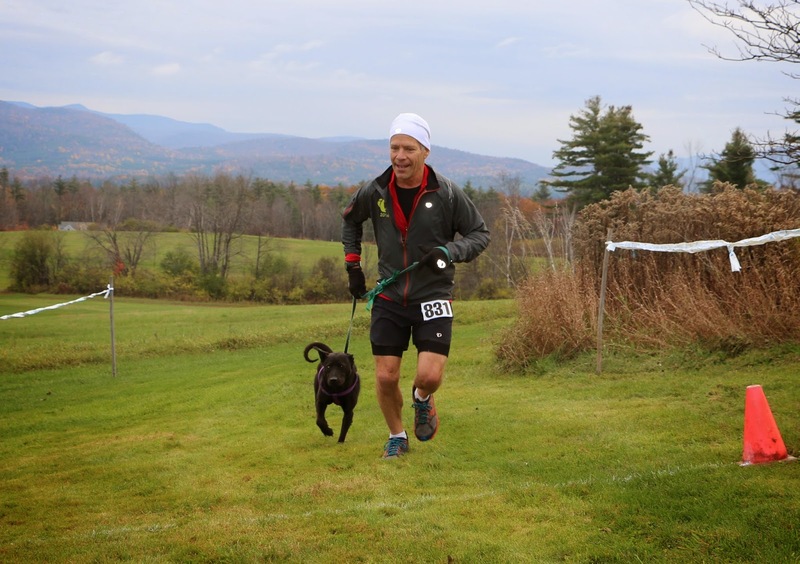 I ran the VT 50 mile in September only to realize I was not trained for the heat at all and found myself lying on my back at times rolling around in pain from full on double leg cramps. 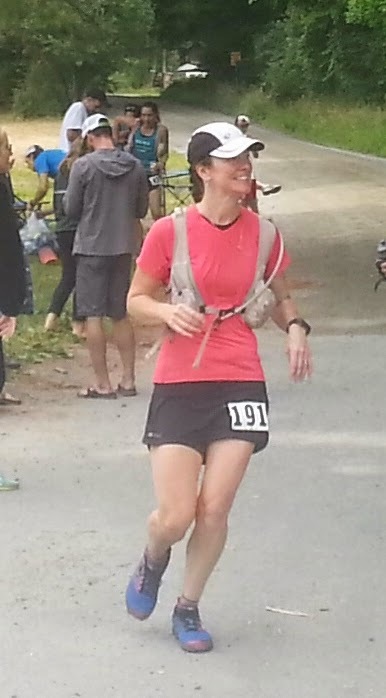 I did crew and pace for Kristin at the VT100 and she had an awesome race setting a new 100 mile PR for herself. 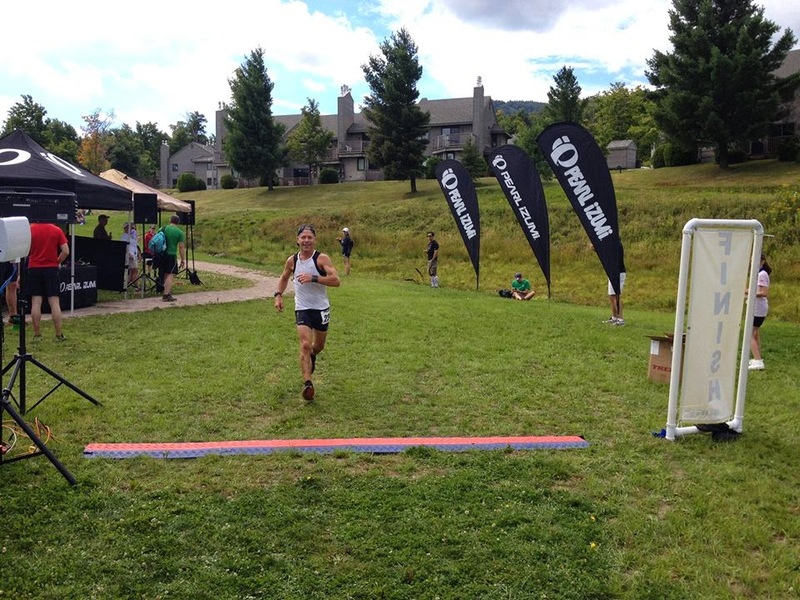 Jay Peak Trail Festival in August, I ran two 5k mountain races, placing second and first. 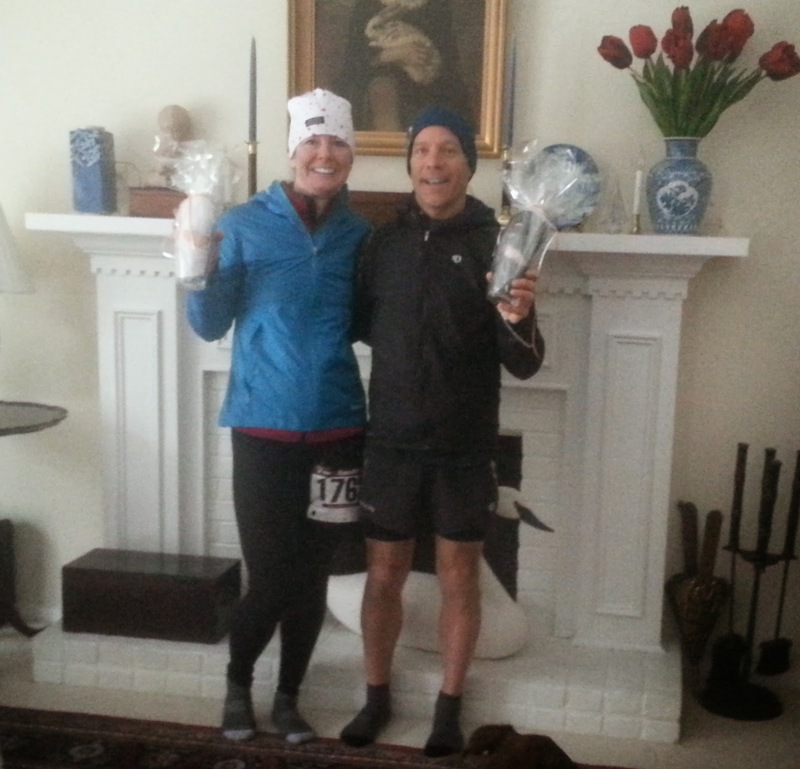 Kristin and I ran the Southbury CT 5K Turkey trot with nearly 2000 runners, both winning our age groups which was fun. And of course Kristin set another PR for herself. 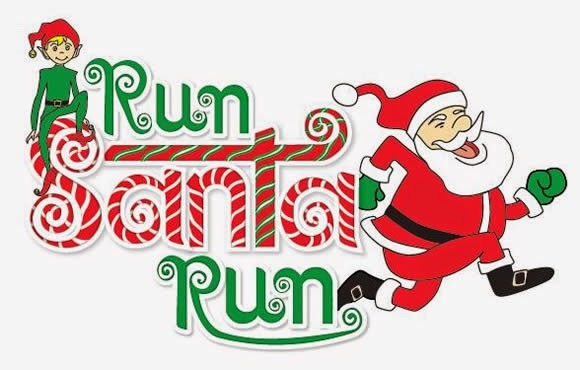 And of course we ran the Santa 5K race in Burlington in December. Definitely not a PR for either one but I came in as 3rd male santa and Kristin had a fun run with Braxton. 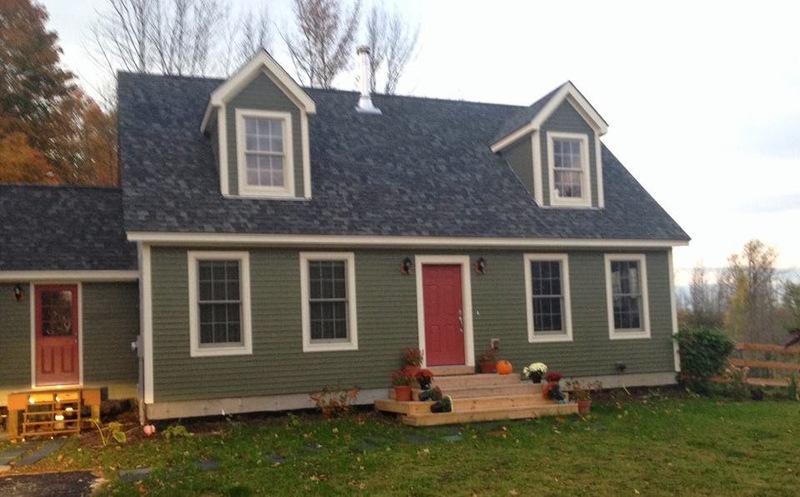 The house is still consuming a lot of time but it's getting there. Next up, finishing the upstairs. I guess it was a busy year. 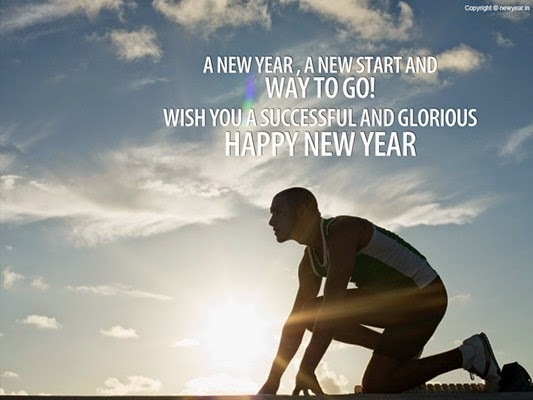 For 2015 I'm looking forward to another fun year with friends, family, puppies and my wife Kristin :) And some more epic races along with working with Pearl Izumi and coaching other runners. See you on the trails!